Two little people (Hem and Haw) and two mice (Sniff and Scurry) live in a maze. Everyday at a certain time, the mice and little people go to a certain place in the maze (Cheese Station C) to get cheese. Over time, the little people develop a routine around getting the cheese, including taking their friends to see the cheese and even making future plans that involve the cheese. The mice, on the other hand , recognize that the situation is not permanent and prepare themselves. One day the mice and the little people arrive at Cheese Station C to discover that all of the cheese is gone. The mice, having forecasted this event, set into the rest of the maze to find more cheese. The little people, on the other hand, are devastated and stay in Cheese Station C, hoping that more cheese will miraculously appear. What follows is a wonderful analogy of how people plan and react to change in their lives. Some, like the mice, prepare for it, embrace it, and thus can enjoy it. Others, like Hem and Haw, can be crippled by it. We all acknowledge that change is inevitable in our lives, regardless of whether it is desired or not. How does the idea of change, however, present itself in our walk with God and His Son? Do we embrace it or do we accept it with conditions? I think that we, as Christians, either consciously or subconsciously, use God's consistency and unconditional love for us as a reason not to embrace the change that he is catalysing in us. Let me put it another way. God's plan for us requires that we experience an evolution. Sometimes, we resist that change or evolution because we have grown too comfortable with where we are spiritually. In order for us to carry the cross or even receive certain blessings, we have to change. The crappy part of it all (Caz, can I say crappy?) is that most of the catalysts that God uses to promote change in us are uncomfortable. He uses things that stretch us; things that force us to recognize that we cannot conquer the deeds of the adversary without being in the spirit. So we must embrace change. The spectacular part is that God is changing us. Each and every day, He is shaping us more and more into the image of his Son, so that when people look at us, they see Him. Just knowing that plan gives me the strength to, not only endure change, but also to understand it, embrace it, and yearn for it. 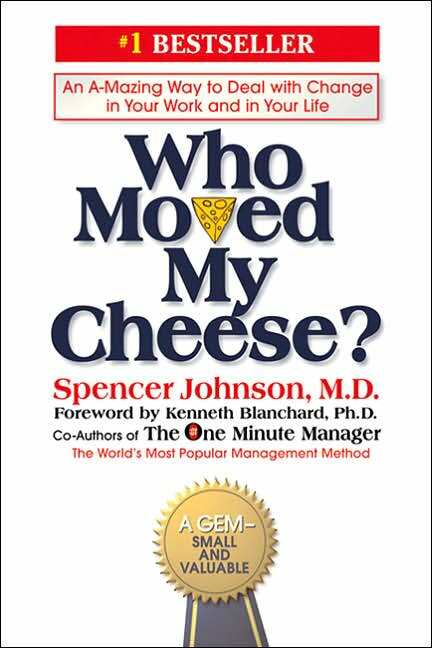 Thank you God for continuously moving my cheese. When I was younger, I had far less patience than I do now (No comments from my mom or my wife please). In fact, my mom told me that "I can't wait" were the three most used words in my young, impatient vocabulary. "I can't wait until I get a bike" or "I can't wait until I graduate from elementary school" or "I can't wait until I have a have a mustache". The list of "I can't waits" was endless. Without a suitable intervention, this three-word mantra evolved into an ingrained philosophy of impatience. "I can't wait to graduate from college" or "I can't wait go to grad school or "I can't wait to have a job." I was living a life that had become a slave to benchmarks. In looking back on this period, I came to several humbling revelations. First, life does not need my help to fly by. Life is perfectly fine with taking all of my unused and unappreciated measurements of time, balling them up into unusable currencies, and letting them roam the recesses of my brain, to be retrieved only by guilt and angst. Second, we must truly appreciate the instances when the Lord has asked us to wait on Him. I know that I deeply struggle with waiting on the Lord. I struggle with listening to Him telling me to wait. I also struggle with asking for the grace and patience to be able to wait. I am sure that we would all agree that a good Christian is able to wait on the Lord when they are asked to. Finally and most importantly, if we are to truly understand the wonderful relationship that the Lord, our father, wants with us... we have to do more than just wait. We also need to APPRECIATE the period in which we have been called to wait. Let me put it another way... I would be so insanely upset if the Lord asked me to wait on Him and I was too impatient to see how he was growing and blessing me during this time. Waiting on the Lord should not be considered something that stretches our faith but rather appreciated as an opportunity to receive a wonderful gift from our Father. I don't know about you, but I have a real problem with being a sinner. Basically, I want to be perfect - AND I want everything I am responsible for to be perfect (including my work, marriage and child). Yes - I know what you are thinking..."Gosh, her poor family!" Yes, I put a lot of pressure on them. But I also put an enormous amount of pressure on myself. I was on the elliptical machine this morning (striving for the perfect figure), trying to figure out how to help my son be more attentive at school (to make him the perfect student) when I started praying to God for help to perfect my life and the lives of those for whom I am 'responsible'. Just about then God interrupted me to tell me to back off of trying to do His job. A song came over my ipod and reminded me that I am not perfect - only God is perfect. It also reminded me that I am forgiven and it doesn't matter where I have been, what I have done, and what the world thinks of me (or my work, or my marriage, or my son) because God loves me even when no one else does. He even loves me when I am a complete failure. In fact, God loves me so much that he became that perfect parent that I keep trying and failing to become. My Father God took responsibility for all my imperfections and sins upon himself; dying on a cross in order to do so. AND YOUR Father God did this for you, also. So, if you are not a perfectionist and have no trouble acknowledging that you are a total sinner and fail everyday - than I give thanks to God for that attitude. BUT if you are like me and hate those facts, then I encourage you to read Psalm 103 on a regular basis. As the Sanctus Real song Forgiven states: "When I don't measure up to much in this life I am a treasure in the arms of Christ because I am forgiven." Give yourself some grace. Be a beloved child of God rather than trying to be a god. “On one occasion an expert in the law stood up to test Jesus. "Teacher," he asked, "what must I do to inherit eternal life?" "What is written in the Law?" [Jesus]replied. "How do you read it?" He answered: " 'Love the Lord your God with all your heart and with all your soul and with all your strength and with all your mind; and, 'Love your neighbor as yourself.'" A psychological study asking the question of “what makes people help someone in distress” was conducted in 1973 by researchers at Princeton University. Princeton Seminary students were given a topic (either post-graduate job opportunities or the Parable of the Good Samaritan) and told to go to another building to give a talk on the subject. Half of the students were given a time constraint. On the way to the building in which they would speak, the students ran across an actor who was pretending to be in need of medical help. Only 40% of the students stopped to give him any kind of assistance. Other studies following the 1973 Princeton University study have all reached the same conclusion as the original - it is not so much our character but our busyness which causes us to deny help to those around us. We are too busy to be bothered with someone else’s issues when we have so many of our own. We often assume that because other people see the same need that it will be taken care of by someone else. In other words, we let our busyness get in the way of our faithfulness to God. It is true that doing good deeds does not earn us a place in heaven, but it is also true that being a Christ follower requires taking care of our neighbors – both those next door, and those around the world. What kind of neighbor are you going to be today? How should I be praying? USE PRAISE-Thank God for everything that He has done in your life including His forgiveness and His Blessings. Thank God for everything possible because we could never deserve anything the He provides us. REPENT-We, as Christians, need to recognize that we sin and sin often. We also need to take responsibility for our sins and hence, internalize how our sins affect our relationship with God. Only after we internalize our sin can we truly ask for forgiveness and develop a plan for not making the same mistakes. ASK- God wants to have an active, intimate, and fruitful relationship with his flock. We cannot have that relationship if we do not give Him the opportunity to show His glory. I know God does not always answer us in the way that we would like, but we at least should be free to ask and understand his His thinking. YIELD-After having an intimate conversation with God, the least we can do is listen to what our Father has to say. Be cautious and patient, however, because His time is not our time...but He will always provide an answer. This plan is, by no means, absolute nor could it ever approximate the level of glory that God deserves. I personally know, however, that my Father in heaven wants a personal relationship with me and appreciates any effort that we give. Tome, Brian. (2008). Welcome to the revolution. Thomas Nelson.